54 Grant Street, Bairnsdale. Phone: 5152 3796. Bistro open for lunch 12 noon - 2pm, and dinner 6pm - 8pm, 7 days a week (closed Christmas Day and Good Friday). 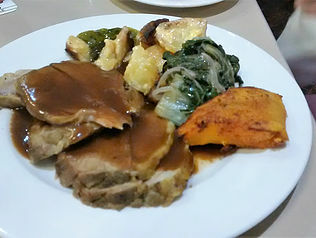 Sunday roast carvery Lunch: $15.00 members, $17.00 non-members (every Sunday except Mother’s Day). "Just off the beaten track but well worth a visit for lunch or dinner." Set slightly apart from the hustle and bustle of Bairnsdale is the Bowls Club or, to be correct, the Bowls and Croquet club. This is a modern venue with a gaming room for those who wish to indulge. 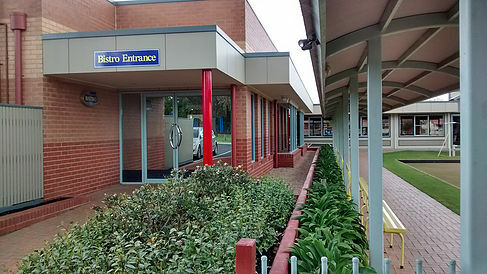 Some on-street parking and a large well-made carpark at the side with easy access into the bistro which allows a view of the bowling green while you eat. Access is very good and in the most part covered should it be raining. (When does it ever rain in Bairnsdale?!). The club is all accessible and has full facilities as you would expect, they are well serviced. The bistro is spacious with good quality seating, tables are well spaced, and the sounds of the gaming room although adjacent do not disturb your meal. Full bar service and counter ordering and pick up of your meal. Tables can be reserved and groups can be catered for by arrangement. It is difficult to know where to start here. I have had both lunch and an evening meal here and the menu is extensive, catering for all tastes and with regular specials there would be few who would not find a meal to their liking. The full menu has all the normal entrée items, and such delicacies as Chilli Chicken, Garlic Prawns or Scallops Béarnaise should tempt you. For mains take your time reading the menu, and it will take some time, a huge array of dishes including a range of seafood, flake scallops, prawns calamari with complementing sauces , they are all there. 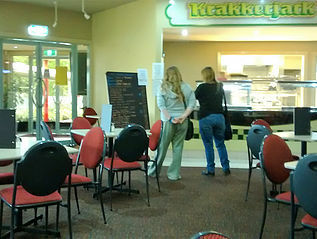 From the grill scotch fillet, beef and reef, schnitzels, parmas all adorn this menu. But wait there’s more, and you won’t need a set of steak knives! A vegetarian selection and then a Thai/Indonesian-inspired range including chicken, prawn or combination Mee Gorang and a then vegetarian option. A range of salads, and a children’s menu of all the favourites. If you are still able to move, try some of the desserts, I dare you. Chocolate and hazelnut with strawberry crepe, Pavlova, or would you believe it, sticky date pudding, if these don’t suit choose a cheesecake from the range. Oh the calories, the sugar, but Oh what a selection. Chef David Whiteside and his Staff certainly aim to please. If it is lunch you are after, you can enjoy and extensive but slightly smaller menu than that which is available for dinner. Having said that, I took a while to choose from the very wide ranging items displayed on the menu. Roast of the day - when we visited it was lamb - crumbed sausages, lambs fry and bacon, cajun pork, lamb cutlets, schnitzels or parmas are just some from the selection. These are all served from the counter and there is a self-serve salad and veggie bar from which you can choose your own favourite. 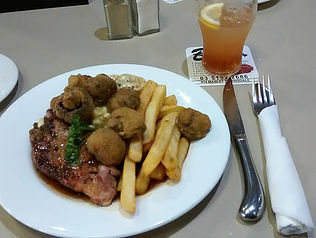 I chose the cajun pork, it came with chips and I added some awesome crumbed mushrooms (I love mushrooms anytime!) and some potatoes with a creamy sauce. There were other items but I was being good! My wife added potatoes with the sauce, roast pumpkin and what I think was spinach and onion mix to her roast lamb, served of course with mint jelly. 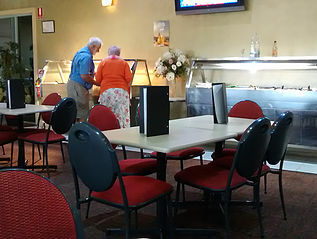 Our lunch was off the cuff and never-the-less enjoyable in pleasant comfortable surroundings, a relaxed atmosphere, well laid out tables and some with a view of the bowling greens. Service was friendly and professional, although I don’t go for those buzzer thingies that tell you when your meal is ready. I always jump a mile when they go off. I do concede that they are the most effective way to manage a bistro though. Just one of my little quirks!! Our lunches were very good value, around $13 will provide you a generous main course, tasty and well cooked. A little off the beaten track but well worth a visit either for lunch or dinner. The extensive menu and generous servings provided at a very reasonable tariff will enhance your visit. This could be busy in the evenings so for a special occasion or to ensure a table I suggest you pre-book. Recommend for lunch, relaxing tasty and top value.